Grindr has responded to the gay Trump supporter who alerted the FBI that the hookup app had shut down his account. And it is delicious. Journalist and right wing darling Chadwick Moore took to Twitter to air his grievances when the app blocked his access for being transphobic in his profile. “If trans women are real women why are they lurking on a gay men’s dating app. And doesn’t the whole trans narrative only deeply further the gender binary? So weird,” he raged in his tweet storm. The FBI did not respond to Moore’s tap. Rude. 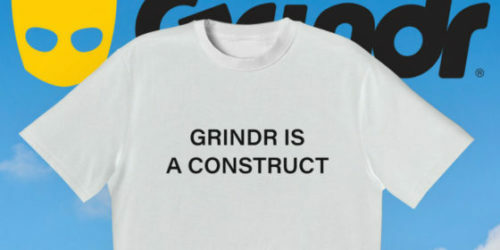 But the company has responded now by offering a limited edition gender neutral t-shirt with the words “Grindr is a construct” emblazoned across the front. Even better, all proceeds will be donated to the National Center for Transgender Equality. “Grindr has created this t-shirt to remind people that all gender identities and pronouns are welcome on our platform,” the company said, “because the future is fluid” with the hashtag #postmodernism.